the key for the dumpster didn't work so we ended up having to take our garbage back with us. Pretty much the only downside we had. The cabin was excellent and we will definitely come back. It's a nice kept secret up on the north shore. We love the condo, the location and the view of the lake. 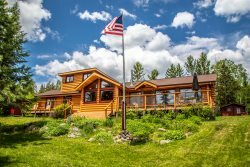 The home was nicely furnished and location to Lutsen ski resort was very good. we especially appreciated how sound proof the unit was. It was New Years weekend, a lot of guests but we were not disturbed by noise at any time. The biggest disappointment was the satellite TV did not work and there were a lot of bowl games on! The condo was great. Really liked having Culligan water. It would be nice to have more games in the game room, such as video games. The home was just the right size and a great location for cross country skiing. It was very clean and the open floor plan made it easy to interact with the whole group. Some suggestions: The cabin needs better lighting in the living room--it only has a couple of small lamps; larger kitchen table--cabin sleeps 8 or more, but table designed for 6; we ran out of toilet paper--supply more at the beginning; knives are very dull. Otherwise, we had a great experience and are thinking of renting the same cabin again. The kitchen area was very spacious and overall there was a lot of communal space to allow for us all to hang out together. In winter especially, it would be nicer if there were more places to put boots and winter coats to dry out when you get off of the ski hill. Also, the pots and pans are poor quality which makes them hard to clean. However, the location, price, and wonderful view of the lake make up for these small problems. We loved the view, how well supplied the house was and the sauna! The soft top to the mattress in the bedroom was a negative. PROS: Great location right on the ski hill. Awesome ski in/ski out experience. No check in or check out needed since this unit uses a keypad. They just email you with everything you need to know about how to get there and what to do when you arrive and leave. No need to wait in line at a check-in desk when you arrive. The unit offers a wood burning fireplace with a firewood and kindling supply right out the front door. Comes with an outdoor ski locker to securely lock up your skis so you don't need to bring them inside. Very clean and cozy, and well equipped kitchen. Fridge has an ice maker that works. The unit is directly above the indoor pool so there is very easy access without having to walk outside. Front desk is very quick to respond if you need anything. Moguls restaurant is only one or two buildings down and had good food with acceptable prices. Very convenient. CONS: This is a main floor unit with multiple floors above. The ceilings/floors are not insulated well for sound and we heard constant stomping and jumping around from quests above us. This made it very hard to relax. I'm assuming they had young kids and had no concern for their lower unit neighbors. Also heard a dog barking non-stop every day we came back from skiing for about 30-60 minutes straight (probably until the owners came back home. May have been the same stomping neighbors, not sure. The sign in the unit claims it is a pet free building, but I saw multiple dogs on the property so this is obviously not enforced. Also complained about the barking dog to the front desk but we continued to hear the dog bark for the remainder of our vacation. Television is ridiculously small with very limited channel offering. WiFi was slow, usable for surfing but no good for streaming video. Water heater went out so after our first day of skiing we couldn't take a shower. Maintenance came very quickly and reset the water heater but the water wasn't warm enough to shower until the next morning. Bed was not very comfortable but it was tolerable. It was the perfect size retreat for our ski vacation with six family members. Beds very comfortable after a day of skiing. Kitchen was adequate for the basic cooking we did. Of course, we really rented the place for the proximity to the Lake and that never disappoints. Everything was clean and was as described. My only suggestion would be to have firewood/kindling inside the home for starting the first fire since we arrived when it was dark outside. Very,very well kept unit. Well stocked with basic supplies. Extremely comfortable with plenty of room for our group. End unit with the extra Windows gives great views. Location is very convenient to Lutsen ski resort. Only negative was we could not find sheets for the pull out on the lower level. Our 2 grandsons brought sleeping bags so really did not cause a problem for us. Reservation, check in, and check out very easy. The house and location were lovely. Lake Superior was beautiful, and we could stare at it all we wanted from the house and from the little lookout. We loved the wood stove, but weren't interested in the sauna. We did have a little trouble with the icy driveway. I'm not complaining, as I know this is a North Shore fact of life, but you might include parking hints in your property info, and maybe a local number for a pull out. (We got out on our own by using various techniques learned over a lifetime of driving in Minnesota.) The Internet wasn't working, but a call to the office led to very quick help. Thanks! The only kitchen items we would have liked would be a drainer and maybe a dishpan to allow for handwashing dishes more easily. Loved the home! Very spacious with a beautiful view of the lake. Only complaint is that the pull out bed in the loft was not very comfortable.